Help me get gearophile started by using the social aspects of the Web, including those in the sidebar (Tweet a page reference from gearophile, add yourself to Thom's Google+ following, subscribe to the RSS feed, post a link to a gearophile page on your own site, or just email a friend about the Gearophile site launch). More on what you need to do in a bit, but first, you want to know what you might win. Glad you asked: a limited edition (only 100 made) gearophile iPad keyboard. And not just any keyboard, but the incredibly light and portable Touchfire keypad that my friend and former coworker Steve Isaac put together with his partner Bradley Melmon and successfully launched via Kickstarter. This is the world's thinnest, lightest keyboard currently made, an example of inspired design, and yes, it works pretty darned well for touch typists. Steve made me a handful of these Touchfire's with the gearophile branding on them, and I'll be giving them away (US$60 value, including shipping; not for the iPad mini, unfortunately) in this sweepstakes. If you'd like to buy a Touchfire rather than trust your luck to the sweepstakes, Steve has created a coupon code for Gearophile readers to save 10%. 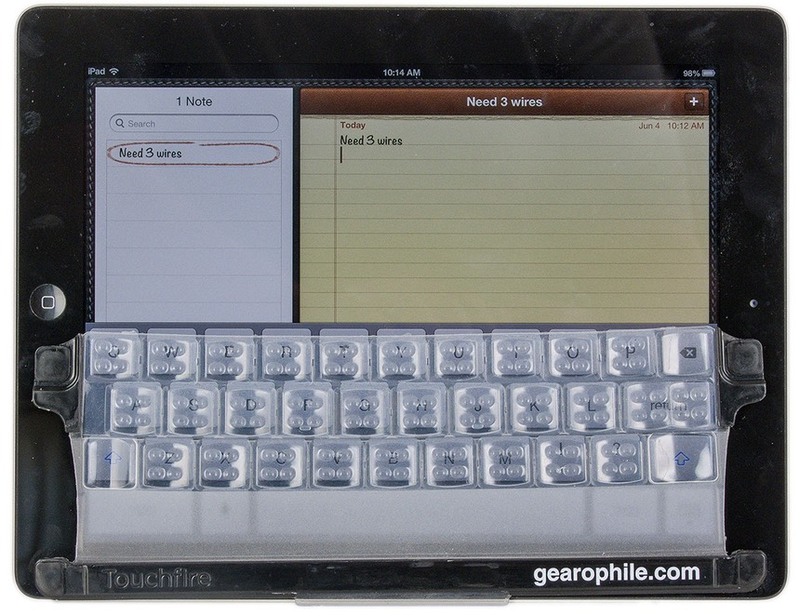 Just type in GEAROPHILE2013 in the coupon code box at checkout on the Touchfire site. Sorry, but due to the wide discrepancies in applicable laws, this sweepstakes is only open to US residents. You must have a US address to win. Use one of the social links in the upper right column to share a sansmirror.com page, any page, with someone else. It doesn't matter which link you use. Like a page, Tweet a page, email a page, or Google +1 it (additional choices are in the Share button). Read the Official Rules, below, so that you understand all the fine print. Then click on this link to enter the information I'll need to process a winner. No purchase is necessary. Only one entry per person will be considered. Anyone found to have entered more than once will be disqualified. Sweepstakes is open only to US residents over the age of 18 only. Employees and contractors of byThom may not enter this sweepstakes. Sweepstakes winners will be declared every month until supplies run out or the contest is closed by byThom for other reasons. You enter this sweepstakes by clicking on the link above. You may also enter by sending your name and address on a postcard to byThom, Gearophile Sweepstake, PO Box 811, Emmaus, PA 18049, postmarked by the last day of the sweepstakes. You are absolutely not required to use one of the social media links on one of the gearophile pages to enter, though it would be appreciated. You are not required to buy anything. The only requirement is that you submit an entry via one of the two free methods indicated (click on link, or send postcard). The winners will receive a limited edition Touchfire keyboard for the iPad, valued at US$60, including shipping. Prizes will be awarded at random to eligible entrants. All prizes will be awarded, and shipped to the winners via USPS. If a winner provides false information or fails to provide the information necessary to ship the prize when requested, an alternate winner will be selected. The number of eligible entries received determines the odds of winning. Winning names will be posted on this site after prizes are awarded and thus available to all entrants to see. You agree that gearophile.com may use your name and likeness for promotional purposes should you win. All submitted information about all other entrants will be destroyed and discarded and not used for any purposes unless you checked the box that indicates otherwise. We cannot guarantee that the simple act of entering might not expose your identity to others, as we do not control traffic on the Internet, nor can we control who sees a postcard before it reaches us. Lost or delayed entries for any reason are not the responsibility of gearophile and will not be considered; we do what we can to avoid technical issues that may cause this, but we cannot guarantee that there won't be any. All disputes will be subject to litigation in Pennsylvania and decided under that state's laws. Entrants release gearophile and its employees, contractors, and owner from all liability entrants may incur by entering this sweepstakes or winning it. This sweepstakes is conducted by byThom, PO Box 811, Emmaus, PA 18049.